One of the most distinct "anthem" rock groups of the 80's, Simple Minds were sort of the Scottish version of their Irish neighbors U2, full of epic visions, powerful band musicianship and a very charismatic lead singer named Jim Kerr. By the time the Once Upon A Time album came out, Simple Minds had recorded six records already with a number of English producers (like the ever present Steve Lillywhite) and some fantastic songs on them. The hit single written for them by Keith Forsey for the film The Breakfast Club, "Don't You (Forget About Me)" took them straight to #1 everywhere. 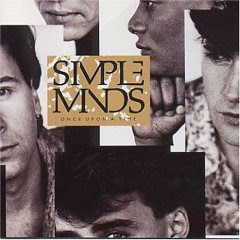 So now that the world knew about Simple Minds, it was time to deliver with Once Upon A Time, except they used the entirely American production team of Jimmy Iovine and Bob Clearmountain. And boy, did they make a difference. While Iovine is better known now as the top executive at Interscope Records and their rap empire, for most of the 80's, he was one of the top rock engineers and producers. Iovine had a personal hand in the production of Tom Petty & The Heartbreakers' Damn The Torpedoes and Hard Promises, Patti Smith's Easter, Dire Straits' Making Movies, Stevie Nicks' The Wild Heart, U2's Under A Blood Red Sky and Rattle & Hum, and The Pretenders' Get Close. In other words, some of the most powerful rock albums of that decade. While I'm sure Iovine became very rich when he tossed being a producer to become a rap music record company executive, it has always been personally disappointing to me that he didn't continue making great rock records. For decades, Clearmountain has been one of the premier rock mixers, and has turned the knobs for Bruce Springsteen, The Rolling Stones, INXS, Bryan Adams, Chic, Roxy Music, Bon Jovi and Crowded House. So you can only imagine what an album would sound like when Iovine and Clearmountain team up together. They did not disappoint. While there was little to improve the sheer force of Jim Kerr's vocals except to continue to soak it in reverbs and delays and bring it up even more up front, this record had crunch. Iovine brought his trademark drum sound wizardry, so even during the low volume first verse of "Alive and Kicking," the snare hits with a hard crack on each backbeat. This was one big sounding album, meant for the arenas Simple Minds was destined to perform at. I've always believed "Alive and Kicking" to be one of the craftiest rock anthem arrangements, although I wouldn't have minded it going on for longer than 4:30. It starts at that simmering level, with a Jupiter or Oberheim synth pad changing chords over the kick drum marching in time, that snare pounding on the two and four. From there, the drum picks up with more motion and echoed distorted guitar notes, and the prominent gospel vocals of Robin Clark. It was a brilliant touch, as she sort of functions as a "Greek chorus" to Kerr's hymn to eternal love. Whats it gonna take to make a dream survive? Whose got the touch to calm the storm inside? Stay until your love is, until your love is, alive and kicking. When reach a climax at the end of the second chorus, the song stops for a second, then a brief Yamaha piano break by itself, and then into that low kick and synth pad pattern, singer Clark getting wilder with wordless gospel vocal, the drums getting faster until the whole thing explodes with the chorus repeated over and over, and what became a surefire 80's sign, singalong words mimicking the countermelody. In this case, Kerr leading everybody in: "Pa-pa-da-da-da, pa-pa-da-da-da, whoa-oo-ooo, whoa-oo-oo." If you are looking at this song's arrangement like a chart, it's low, gets a little faster, building up louder, stops, back to low again, picks up speed and volume and finally ka-boom! U2 seems to unfairly get the lion's share of "great rock anthems," but Simple Minds had an impressive number int heir arsenal. "Alive and Kicking" was played nightly at the Club Med disco on Turks & Caicos when I went down there in 1985 with some single friends (including a fellow who called himself "Herbie The Human Grouper") to expand our social horizons. The DJ had phenomenal taste to crank this over the system, so we could do our arm waving Jim Kerr impressions. In the late 80's, living next to me in a Briarwood, Queens apartment building was this short muscular Italian gay guy who had a stereo system that could power New Jersey. I thought my system was pretty good, but this guy was seriously into high-end equipment and "specs." Periodically, I would bring over an album or CD because I knew he'd like it as well as the production. It was a no-brainer to bring over the Once Upon A Time album and tell him to drop the needle on "Alive and Kicking," sit on his living room couch and take it all in. Below is the official "Alive and Kicking" video, with the band getting all cosmic and nuts overlooking some tall cliffs and beautiful vistas. Then, Simple Minds performing it at the 1995 Glastonbury Festival, followed by a 2002 version with an orchestra and full complement of female background singers. I love the blog. I check in often to see who made the list today, and love the variety. We're doing something kinda similar over at the Ripple Effect, except we focus on new, unheralded and lost classic artists. Check us out at www.ripplemusic.blogspot.com.